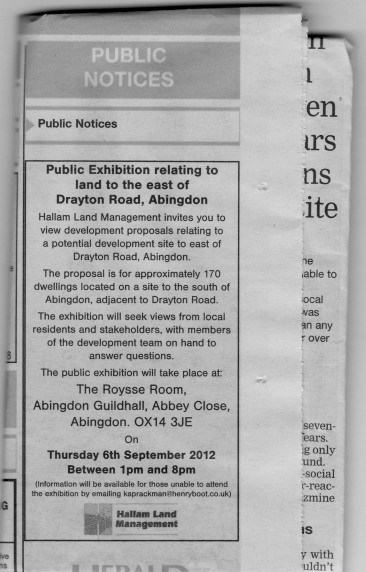 Thanks to Hester for spotting this one in the Public Notices section of yesterday’s Abingdon herald. A company from near Bristol are looking to get planning permission for 170 dwellings off the Drayton Road near Virginia Way in South Abingdon. More detail of the exact location will be given at the public exhibition. If anyone knows more please leave a comment. A climb up to the top of the Charter Multi-Storey Car-Park by the side stairs this evening. If you do watch the video and are of a nervous disposition you might want to stop at Level 7. Back in the 1950s a group of Christians wanted to create a church in the expanding housing developments of North Abingdon. 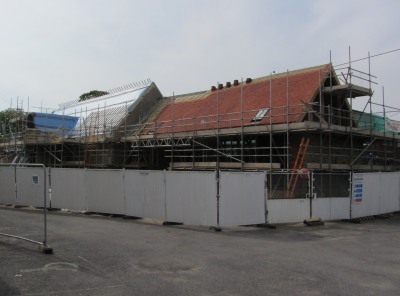 They took over a dilapidated tithe barn in Northcourt, that had been part of a dairy, and restored it sympathetically for use as a church building. It is now the building for a growing church – Christ Church in Northcourt. People from Christ Church in Northcourt then went on to set up a second church in Long Furlong, a little further north, where Abingdon housing had expanded in the 1980s. 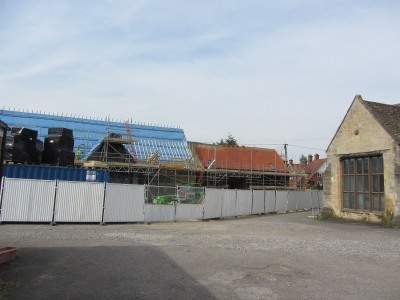 In the last couple of years Christ Church has taken over the remainder of the dairy barns and this year are restoring the largest barn for use as a coffee shop and community space. 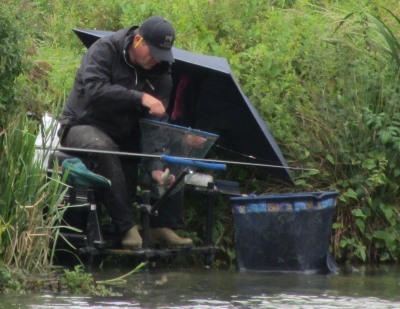 On Saturday there was the Mayor’s junior fishing competition, and today, on August Bank Holiday Monday, there was the senior competition. The Mayor of Abingdon presents the prizes at both. The day was overcast with occasional showers. 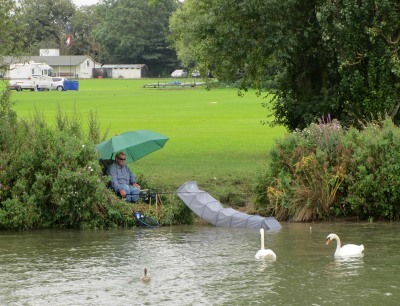 Fishermen were to be seen from near Abingdon Lock to opposite the sailing club on Wilsham Road. The person with the heaviest catch wins so even little tiddlers get kept. All fish are released after weighing. 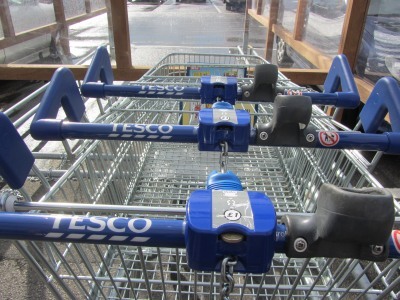 At the Tesco Extra superstore just off the A34 in Abingdon a new system has been introduced to try to prevent supermarket trolleys being nicked. 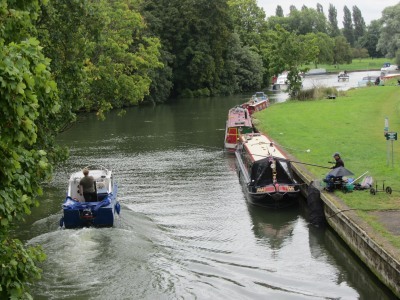 This is a long standing problem as many a trolley has ended up either in the River Ock or the River Thames. The new system means that customers put a £1 deposit into the trolley which is returned when the trolley is returned. The system appeared to be fairly new as a lot of customers were having to hunt around and ask other people if they had the £1 change. 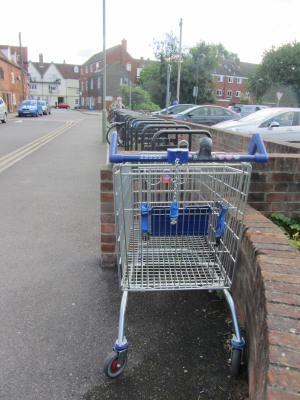 A Tesco trolley was seen this morning near the West St Helens Street Carpark minus the £1 deposit. 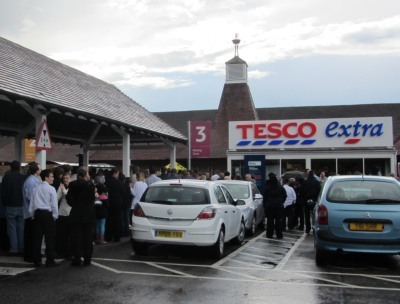 But then no system involving supermarket trolleys can ever be totally foolproof.